Jon Jones was still in the octagon when he identified and challenged his next preferred opponent. If this all seemed contrived…well, welcome to fighting sports. Rumors had been swirling since mid-July about a possible Brock Lesnar vs. Jon Jones superfight. Fan fiction about a Lesnar return to UFC pops up occasionally, but this one has a little more to it. Lesnar’s WWE contract ends in April of next year. There’s a renewal option—but even so, WWE has let an under-contract Lesnar fight in UFC before. Everyone rushed to douse cold water on the rumor. Lesnar officially retired from non-scripted fighting after the UFC banned him for a year for positive drug tests around his decision victory over Mark Hunt at UFC 200. (That result was changed to a no-contest.) In order to fight legally, Lesnar would have to unretire, go back in the USADA testing pool for six months and concurrently serve the remaining six months and 12 days of his suspension. Lesnar isn’t back in the testing pool currently, so a fight couldn’t happen until 2018 at the earliest. Naturally, then, Lesnar and Jones called each other out after UFC 214 on Saturday. To muddle the waters even more, last night on Raw they planted the seeds for Brock Lesnar’s eventual departure from WWE. Lesnar defends his title at SummerSlam later this month in a four-way against Roman Reigns, Samoa Joe, and Braun Strowman. 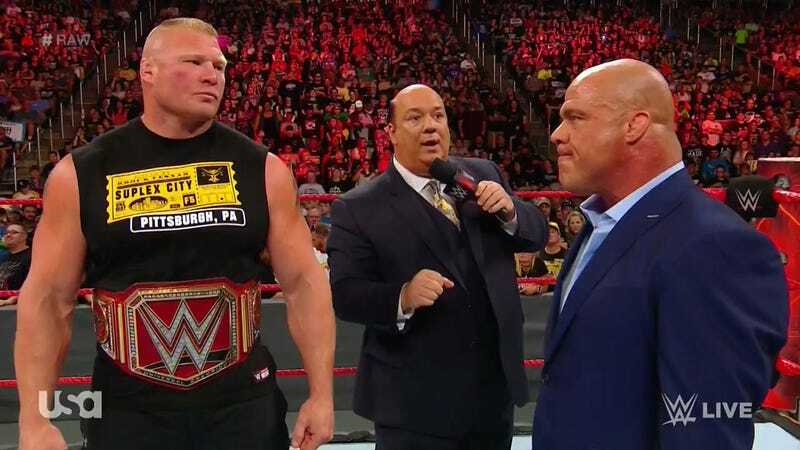 Heyman interrupted Raw GM Kurt Angle and said that if Lesnar loses at SummerSlam, he and Lesnar are leaving WWE. Get it? WWE is playing off the rumors of Lesnar leaving WWE at some point and turning it into high stakes for their biggest event of the summer. (Heyman’s promo last night was excellent, even basically winking and saying that Lesnar was paying the “ultimate price” in the four-way match.) Now SummerSlam is possibly Lesnar’s last match, and we have the UFC rumors to make you believe it. And now we have a build for an eventual Lesnar vs. Jones MMA match that has been conducted on messageboards, Facebook Live chats, UFC press conferences and PPVs, and now WWE weekly programming. In my wildest dreams they could have a ringside confrontation at the Mayweather/McGregor fight, or perhaps Jones will cost Lesnar his career at SummerSlam. Or maybe it’s all a ruse—by someone—and Lesnar is going to stay in WWE when his contract is up next year. Who cares! It’s just started and this is already a great storyline, whether it leads to wrestling matches or mixed martial arts fights.